Precipitation of oxidized iron can lead to blocks primarily in narrow water passages, for example, in agricultural drippers and mini sprinklers. Iron bacteria causes bio film build-up which eventually blocks pipes and irrigation drippers. Our iron removal system uses technology that cuases oxidation of dissolved iron and manganese into an insoluble form. Removal of the fine oxidized particles is then accomplished via multi-media filtration. 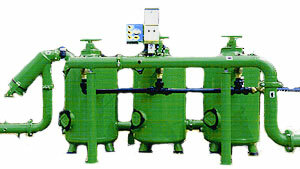 Ecologix offers modular, fully automatic arrays with minimal water waste, for various flow rates. These arrays do not require concrete infrastructure, have minimal maintenance requirements and supply optimal protection for drip irrigation systems. The systems are based on multi-media filters. The filter’s media is crushed bazalt. Potassium permanganate is used as oxidant.